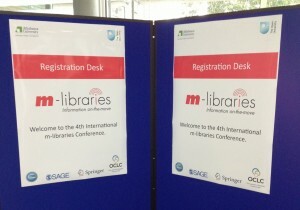 On 24th-26th September 2012, The Open University hosted a group of 163 delegates from 19 different countries for the Fourth International M-libraries Conference. It was the first of the m-libraries conferences I have been able to attend in person, though I have followed others from afar. The theme of the conference, From margin to mainstream: mobile technologies transforming lives and libraries, demonstrates the progress made in the area of m-libraries, and this was evident from many of the keynotes and parallel sessions. The keynote sessions were all recorded and are now available online, and I created an Eventifier archive which has some of the presentations from both the keynotes and parallel sessions, as well as photos, videos and tweets. Rather than recreate notes from each session, I wanted to highlight some of the key themes emerging from the conference. Some of the most interesting presentations highlighted some of the innovative ways mobile technologies are being used in different countries. Steve Vosloo talked about projects UNESCO have been working on including Worldreader: books for all (which brings reading material to the developing world via Kindles or through their mobile phones via biNu), and literacy promotion via mobile phones (including educational information). We also heard about projects in India involving m-learning applications on the cheapest tablets in the world – less than $2 each! It was also interesting to note different challenges and benefits in different countries. For example, SMS messaging services aren’t widely used in UK due to cost, but in India this is not an issue. Kindles are robust enough for use in most countries and climates, but don’t deal well with the dust in Africa. Just a couple of examples of many things I previously hadn’t considered which were raised by delegates and speakers from across the world. There were some really innovative projects discussed at the conference, and many of these were from libraries that didn’t have funding for equipment or development. I attended some fantastic parallel sessions on innovations that utilised existing services to support delivery of library services. Georgina Parsons (Brunel University) spoke about their use of freely available services like Facebook, Twitter, QR Codes, and services they already subscribed to which offer mobile support like Summon, BookMyne and Library Elf. Neil Ford (Bournemouth University) shared their project on using QR codes to highlight electronic resources to students when they are browsing the physical library. The process incorporates checking reading lists to understand more about the courses, preparing relevant searches on electronic resources, and delivering those via QR codes and custom URLs on bookmarks near the key books for that area. The majority of this exercise is staff time and will also be useful even if the QR code uptake is low (i.e. 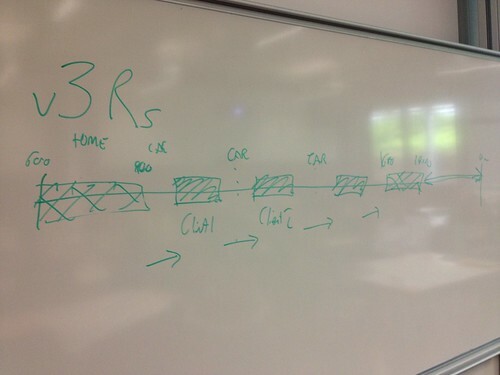 better understanding of content of courses). One of the presentations was from a representative at Microsoft, and other key players in the technology field were also mentioned throughout presentations. Martin White’s keynote focused entirely on developments of commercial companies such as Microsoft, Google, Apple and Amazon. The clear message coming through these presentations and the general discussions during the event was the reliance on developments from these companies. For example, some technologies which could enable additional functionality of mobile devices (e.g. contactless payments) will only become more popular if they are incorporated to the majority of devices. There were a number of presentations which started with statistics based on user surveys/interviews or other anecdotal observations from discussions with users. Many of these demonstrated a shift in user expectations – more now seem to be expecting libraries to be delivering content and services via mobile devices. Mobile as a major trend and a key concern for libraries and other related organisations – see for example the UCISA 2012 Survey of Technology Enhanced Learning for higher education in the UK, the ACRL 2012 top ten trends in academic librarianship, and LITA’s Top Tech Trends at ALA Annual Conference. It seems, as with the theme of the conference, that mobile is becoming mainstream and is now expected, rather than being an additional bonus. This entry was posted in Events and tagged mlib12 on November 15, 2012 by Jo Alcock. Registration is now open for the 7th Handheld Librarian Online Conference on 15th-16th August 2012. I attended Handheld Librarian 5 (see my post on my personal blog) and found it really useful; I’d definitely recommend attending. It’s great value for money and even if the timezones don’t work out for watching it live you can watch recordings afterwards with your login. Can’t be there for the whole day? 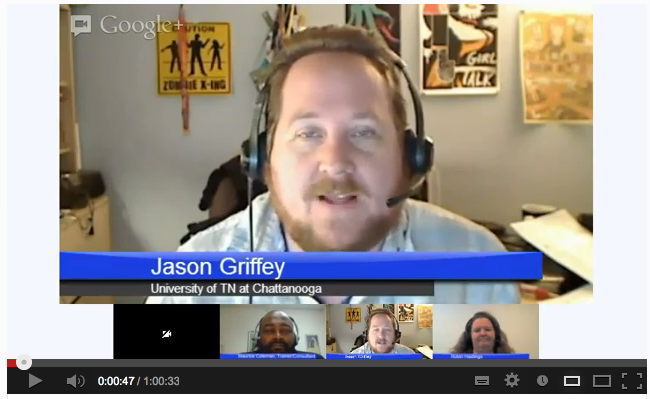 You will have access to the Archive to view after the conference. Individuals can Register for Conference Only (Aug. 15, 2012) – US $65, Register for Conference (Aug. 15, 2012) and Workshops (Aug. 16, 2012) (add $35 each workshop). Reduced pricing is available for groups. 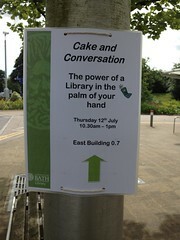 This entry was posted in Events and tagged handheld librarian on July 26, 2012 by Jo Alcock. I began the workshop by giving an overview of some of the work currently happening in mobile technologies in libraries, including the work of the JISC Mobile Infrastructure for Libraries programme as well as further afield. I’m currently working on some pathways to best practice documents on a number of different topics and shared some of the examples we’ve collected as part of that. Gill then gave a really useful overview of the work Open University have been involved in over the last few years, researching how users could utilise mobile devices for library resources and services, and how their mobile offerings have developed. One point I found particularly telling is that access to resources via mobile is one of the criteria used by Open University for selection of online resources, demonstrating the fact that this is now expected rather than an additional bonus. Laura (click for full persona) is a researcher in psychology who spends a lot of time travelling and therefore needs to be able to work (e.g. perform literature searches) whilst mobile, using her iPad. 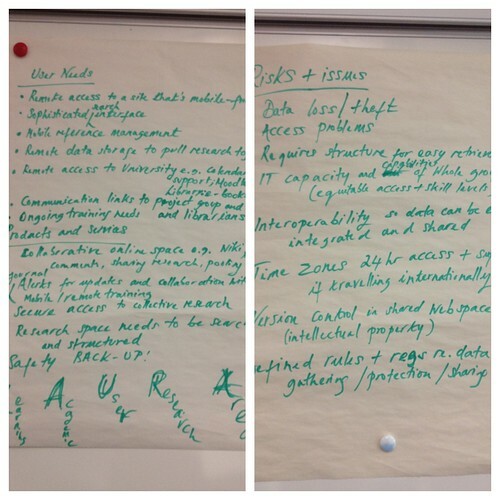 The group came up with an idea for a collaborative online research space called LAURA (Learning Academic User Research Area) which would enable Laura and her colleagues to add notes, comments and ideas about the research from wherever they are to a secure area which is regularly backed up. This area would be structured and searchable, and would also include journal alerts for relevant research. Simon (click for full persona) is a Sports and Exercise Science student who spends a lot of time playing sport. He tends to study during the day as he works or socialises in the evening, and although he visits the library regularly he isn’t familiar with the library systems or how to find library resources. 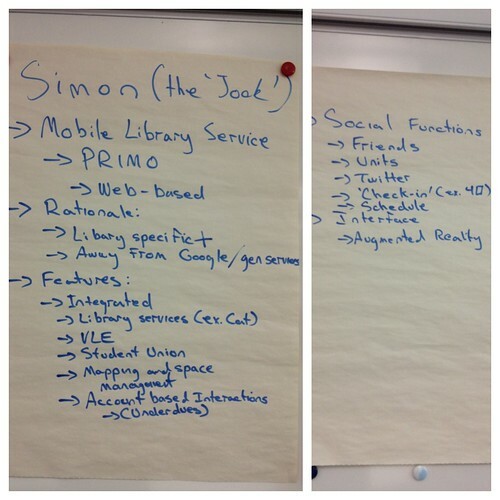 The group decided to utilise the opportunity to promote the library services to Simon by developing a mobile web service. This service would provide library specific as well as extra study resources and would integrate VLE, Student Union, maps and space management, and account information as well as provide social functions and augmented reality. Sandi (click for full persona) is currently on placement for her social work degree. She spends a lot of time travelling between clients and also is a single parent of a young daughter. She struggles to organise her work and studies and has very little time for reading but is aware that she needs more. The approach this group took was really interesting – they broke her day up to work out when she could study and what they could develop to help her. They came up with the idea of a v3Rs (Voice Recognition Reading Recommendation Service), which she could use whilst driving to dictate notes based on her experiences with clients. This would free up time which she usually spends typing up notes, and would also act as a smart search engine. The system would look for key research terms within her notes, and search subject specific databases for relevant readings. When she was ready to study that evening, she would have a list of the appropriate resources ready to read. Joshua (click for full persona) is a final year student studying International Management and Modern Languages. He has recently returned from his year studying abroad, and travels regularly both for studying and volunteering during vacation. The group highlighted the fact that for some like Joshua who travels a lot, offline access to material is important to reduce roaming data charges, and access to resources from different devices is an advantage. 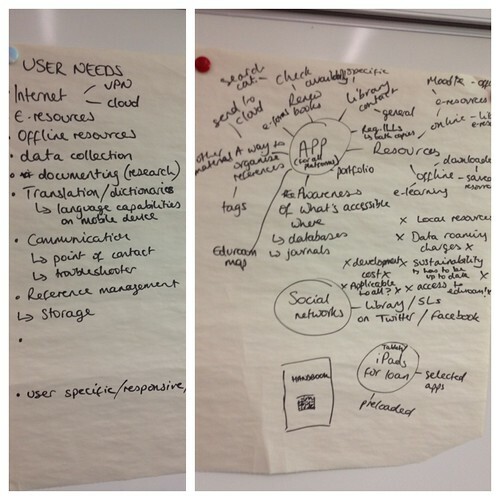 They came up with the idea of an app for all platforms which would bring together all the relevant study resources including library services and resources, VLE, bibliographic management, portfolio and social networks. As much of this as possible would be available for offline download so it can be accessed without an internet connection. Jamila (click for full persona) is studying for an MBA via distance learning. She is sponsored by her employer and works as a senior account executive for a large advertising agency with offices in New York, Tokyo and London. She travels a lot and is constantly connected online via her MacBook, iPad and iPhone. 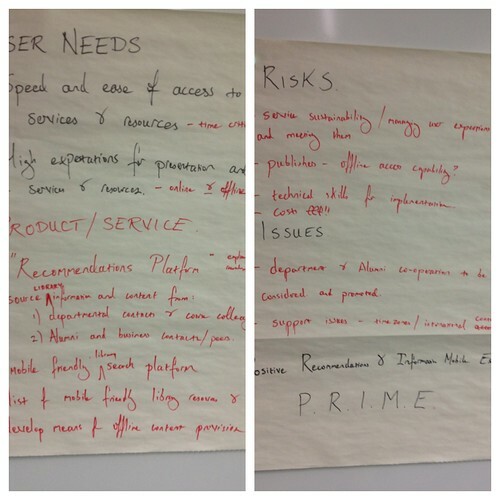 The group came up with an idea for PRIME (Positive Recommendations & Information Mobile Experience), a mobile-friendly recommendation platform that would source library content from departmental contacts, course colleagues, alumni and business contacts and provide a means of offline content provision. Liam (click for full persona) is an art history academic with a flamboyant teaching style. He isn’t too comfortable with technology but knows he needs to meet the expectations of his students to understand more about how to utilise mobile devices. The group came up with an multi-pronged approach for Liam to provide support for both his own needs and his students’ needs. 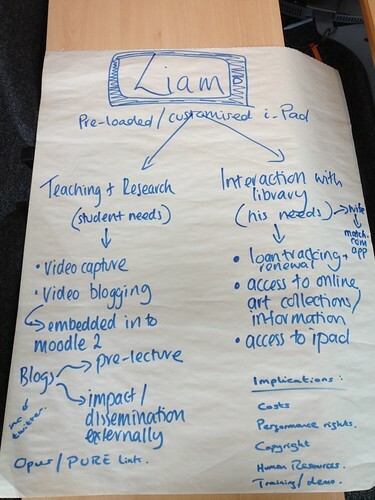 Liam would have a pre-loaded customised iPad with capability to capture videos and post to a video blog which would be embedded into Moodle. This would be used for additional lecture material or pre-study material. For his own needs the iPad would be used to help him manage access to library resources, both online resources and reminders for renewing print resources. Following the presentation of these ideas, Gill and myself briefly gave an overview of some of the steps forward including the community support aspect of the JISC m-library community support project and the International m-libraries conference at Open University in September. I’d like to thank both the organisers and the attendees for a really engaging workshop and lots of innovative ideas, and Gill for working with me to deliver this workshop. This entry was posted in Events, Evidence gathering and tagged gill needham, mlibs, university of bath on July 18, 2012 by Jo Alcock.